Is it actually possible to have an ecstasy tablet which contains MDMA, cocaine and ketamine? 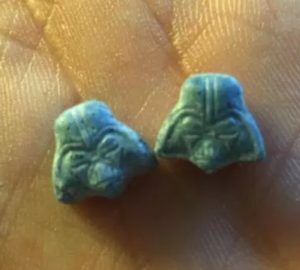 North & West Devon police have issued a warning about “Darth Vader” tablets today, saying that “it is a dangerous mix of MDMA, ketamine and cocaine”. This is very surprising as ecstasydata has never recorded a single incident of pills with this combination of drugs over the last 15 years. After being asked, N&W Devon police reveal that the pills have not been lab tested. In the absence of any real knowledge, can we critically analyse the speculation about the contents? MDMA is commonly distributed in tablets for a variety of reasons, namely the increased ease of dosing and ability for “brand recognition” to supposedly make it easier to identify fake pills with more dangerous contents. Unfortunately, with pill production equipment readily purchasable on Amazon, this is not an effective strategy. So the suggestion that there could be MDMA in these tablets is certainly plausible. Cocaine however, is almost never seen in pills, and for very good reason. Cocaine contains two “ester” bonds in the molecule, which are very vulnerable to being broken down by water and acids. Since the stomach is a strongly acidic environment, when cocaine is eaten it starts being broken down immediately, and then gets passed to the liver which destroys more. This means the dose of cocaine required when taking it orally is much higher. In order to include a meaningful amount of cocaine in an ecstasy tablet would therefore massively increase the price of the tablet. As well as this, cocaine is a strong local anaesthetic (causes numbness) so any would-be user who put the pill into their mouth would immediately realise something unusual was afoot when their tongue started to go numb. Ketamine is another drug which is almost never taken orally because it too is fragile, and easily dismantled by the liver. Since all blood from the stomach passes through the liver before going to the brain, this means that a lot is destroyed before it can affect the body. Coupled with the fact that absorption from the gut is much slower than the nose, this means a very high dose is needed to reach the same concentration in the brain. The outcome of this is that adding a meaningful amount of ketamine to a tablet would massively increase the size of the tablet. Trying to add a meaningful amount of all three of these drugs to a tablet would likely result in an enormous tablet which was incredibly expensive and immediately identifiable as abnormal, even by black market standards. So, is it possible? Yes. But is it likely that a pill containing this combination of drugs has been detected for the second time in 12 years? No. I would argue that any authority claiming to have discovered something very unusual should apply extra scrutiny to that discovery before announcing it to the public, and possibly consult with experts beforehand, at the very least to apply a sense-check. With all this said, it is refreshing to see a police force sharing as much information as they can (good photos and suspected contents) in the interest of public health – I suspect that the damaging cuts to public services over the last 8 years have impacted the ability of the police to access experts at short notice within their budgets. Perhaps by waiting a few days for a test result confirmation could have meant more people falling victim to these tablets. Really what we should be calling for is the central government to provide funding for testing facilities that are more easily accessible. Until then, home users can use simple reagent tests to alert themselves to cases where a different drug has been sold in place of the one they were expecting. We’re excited to finally be adding the Mandelin reagent to our stock. This is a crucial reagent for the detection of dangerous PMA and PMMA substituting MDA and MDMA. The two are not commonly mixed but PM(M)A is not detected by the Marquis reagent so this can lead to a false sense of security with Marquis but with the Mandelin reagent a reddish brown reaction is given. 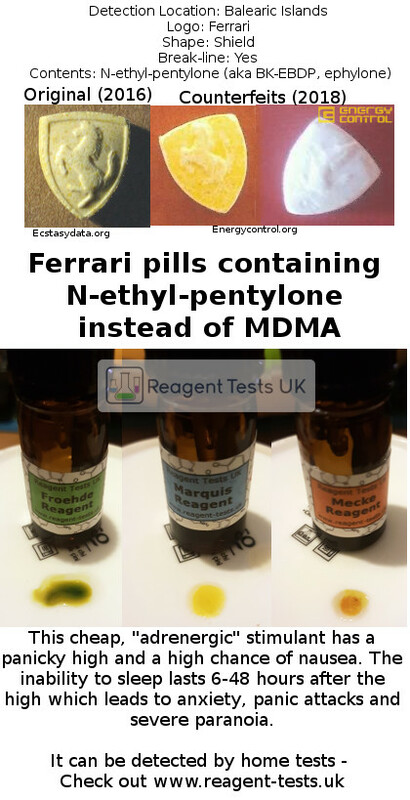 The Mandelin reagent can also be used to identify ketamine and cocaine, which give deep orange/red and deep orange/yellow reactions respectively. Welcome to the RTUK blog. Here we will publish reports about our work developing new tests and characterising the results obtained from new substances.